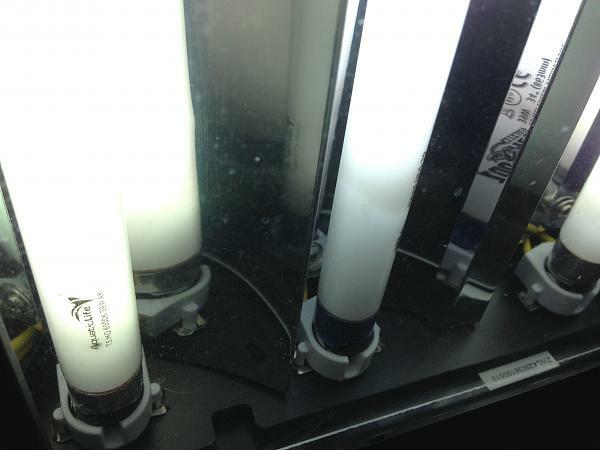 Before any discussion of aquarium lighting can proceed, first we have to debunk the myth about “watts per gallon” being a measurement of light intensity.When the only practical source of light for a planted tank was T12 fluorescent tubes, someone decided that the way to pick out the best lighting was to figure out the “watts per gallon” that were needed to grow various types of plants. This would make sense if we could pour a teaspoon of watts of light into a tank, and get a light concentration of X watts per gallon of water, just as we pour a teaspoon of potassium nitrate in the tank to get a nitrate concentration of Y mg per liter of water. But light is nothing like a chemical – you can't pour it anywhere, you can only shine it on something. That alone should debunk “watts per gallon” as a measure of light intensity. But, there is more: Let us assume we have two 20 gallon tanks, with 40 watts of T12 Fluorescent light on each one – 2 watts per gallon. One tank is a 20L and one is a 20H. The 20L tank is 12 inches high, and the 20H tank is 16 inches high. If the fluorescent light sits right on top of each of the tanks, the light on the 20H tank is 4 inches farther from the substrate – 33% farther from the substrate. Because light intensity drops approximately proportional to one divided by the distance from the light squared, the intensity at the substrate in the 20H tank has to be about 56% of that at the substrate in the 20L tank. That alone should debunk “watts per gallon” as a measure of light intensity. But, there is more: Let us assume we have two 20H tanks, one with a 40 watt T12 light sitting on top of the tank, and the other with the same light hanging 12 inches above the top of the tank. 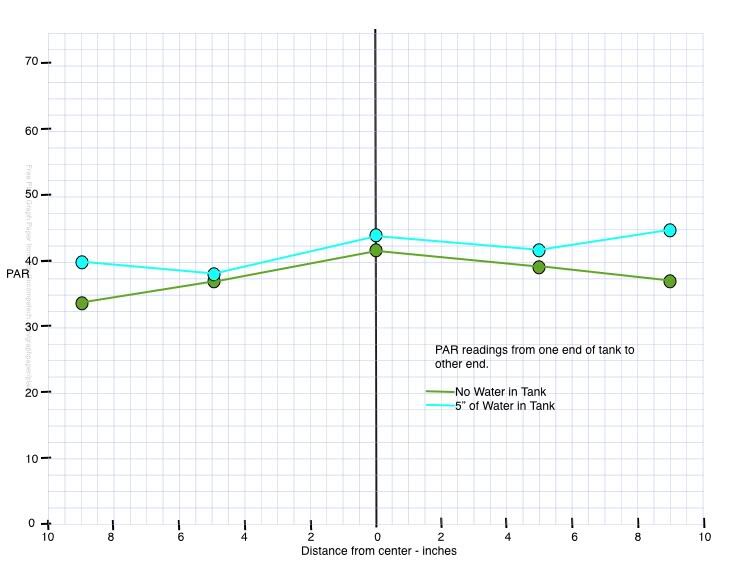 Again, because light intensity drops approximately proportional to one divided by the distance from the light squared, the intensity at the substrate for the tank with the light hanging 12 inches above the top of the tank must be about 32% of the light intensity of the tank with the light sitting on top of the tank. 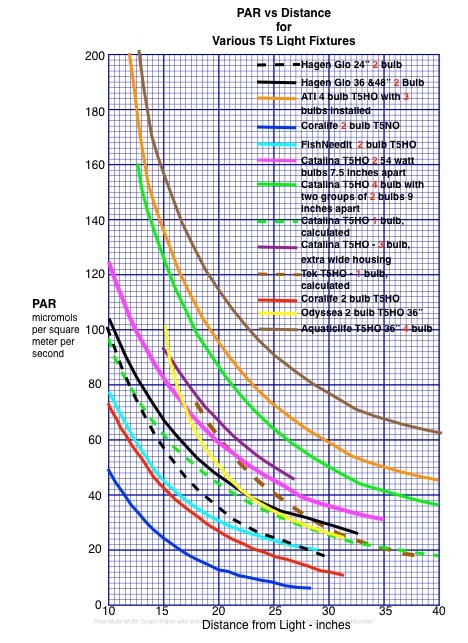 And, that alone should debunk “watts per gallon” as a measure of light intensity. So, that is three strikes against “watts per gallon”. But, there is more: Let us assume we have two 20H tanks, one with 40 watts of T5HO light, from a Tek light fixture, the other with 40 watts of T12 light. Anyone who has looked at both a T5HO bulb and a T12 bulb, when they are lit up, knows that the T12 bulb can be stared at without distress, but the T5HO bulb causes some temporary blindness if you look at it for more than a few seconds. 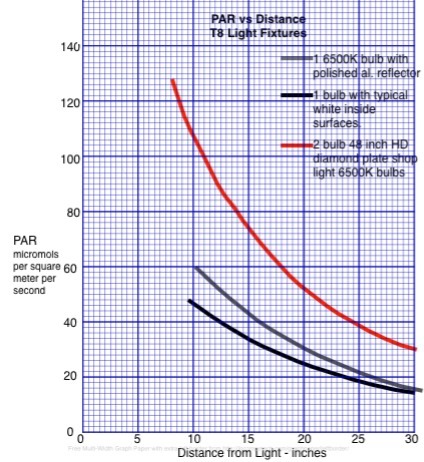 The T5HO bulb is much, much brighter, and has to give much more light at a given distance than the T12 bulb. “Watts per gallon” is dead! Light intensity can be measured in lux, which is the intensity as perceived by human eyes. Or, it can be measured in PAR units, which is the intensity as perceived by plants. PAR is an acronym for “photosynthetically active radiation” – the radiation (light) that is used by plants for photosynthesis. The units of PAR are micromols of photons per square meter per second. 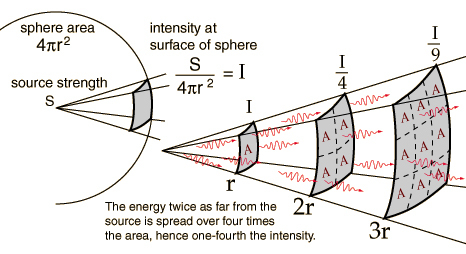 So, a PAR of 1 is one millionth of a mole of photons striking a one square meter area every second. Human eyes see the yellow green area of the spectrum of light very well – our eyes are very sensitive to yellows and greens, but we see reds and blues much less well. 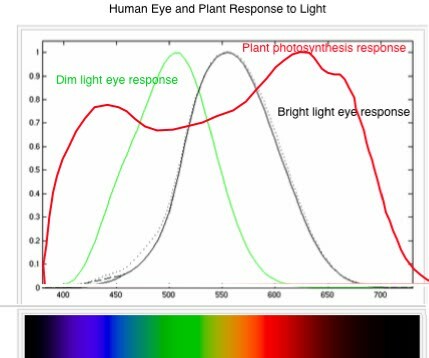 Plants are very sensitive to reds and blues, absorbing most of the light in those colors, but less sensitive to yellows and greens, reflecting a lot of the light in those colors. That is why most plants look green or yellow. The best way to find out how much light intensity we have in our planted tanks is to measure it. 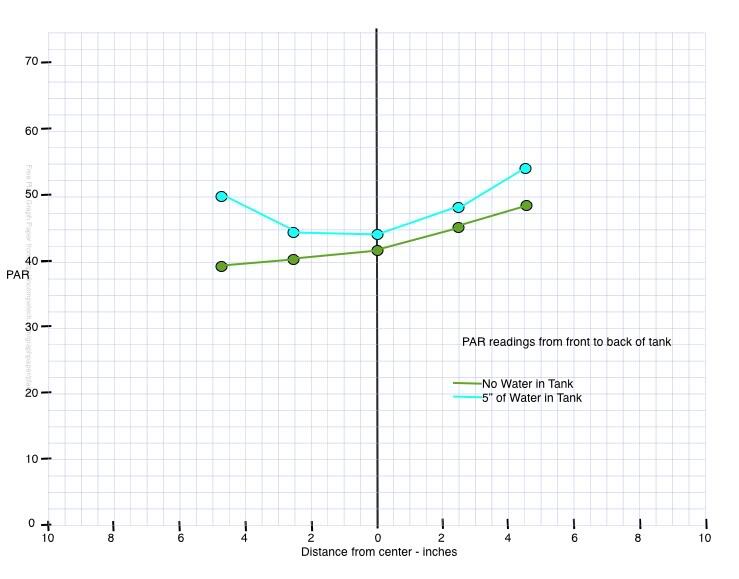 To do that we must use a PAR meter. A few years ago the only PAR meters available cost a few thousand dollars apiece. Now there are much cheaper PAR meters available. You can buy a Quantum PAR meter, Model MQ, for $329 plus shipping. That is a near laboratory quality meter, with a guaranteed calibration, which can be re-calibrated at the factory when needed. It is the Cadillac of hobbyist PAR meters, usually bought only by clubs, where many members can use it. A lower priced version of the Quantum PAR meter is just the sensor, Model SQ, for $139 plus shipping. To use this you need to either use a good millivoltmeter, which gives the best accuracy, or a cheap lux meter, like the Mastech LX1010BS, from Amazon.com, at about $20 plus shipping. Used with the lux meter you need to do your own calibration. You can use your digital multimeter, with a millivolt scale and the sensor, to determine the PAR from a light at a fixed distance, then connect the Mastech lux meter to the sensor to see what the meter reads at that PAR. This gives you a calibration constant for that combination of sensor and meter to convert lux to PAR. Still cheaper is to buy one of the DIY PAR meters made by Mistergreen and/or O2surplus, for about $60. These are calibrated, and the meter reads in PAR units, but they may not be available when you want to obtain one. Cheapest is to buy a Mastech LX1010BS, at $20 plus shipping, and modify it yourself, but you have to calibrate this yourself. However, the total cost should be $35 or less. If the Quantum PAR meter is the Cadillac of PAR meters, this is the refurbished Volkswagon bug of PAR meters. Before we can even start to measure the light intensity, or PAR, that a given light will provide on our tank we first have to obtain the light. It may seem that we have to be working blind when we make this selection, given that knowing the “watts per gallon” won't tell us anything about the intensity we will get. 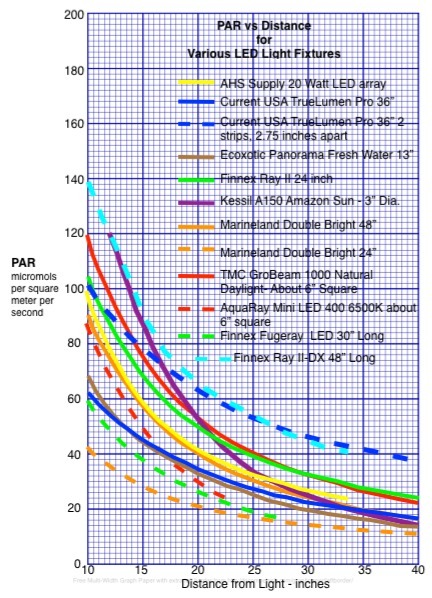 But, because there are now many PAR meters in hobbyist's hands, we now have a lot of data on how much PAR we can get from several different lights, made by several different manufacturers. More data becomes available every month. 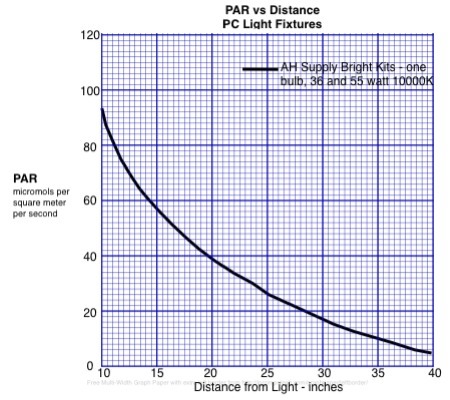 For each of those types of lights a chart can be made showing the PAR produced by the light versus the distance from the light. These charts show the light intensity as measured without a tank of water being involved – just the intensity as measured in air. This is necessary to avoid the many variations in intensity caused by the tank dimensions and the cleanliness of the tank glass, both of which can have about a 10-20% effect on the intensity. The following charts show the data that I now have for various lights. As I get more data I will keep updating the charts and adding new ones. If you want a light that isn't included in the charts you can study the reflectors used in the light you want and compare them to the photos following the charts to see which charted light is closest to the one you want, to get a rough guess at what PAR that light will give you. 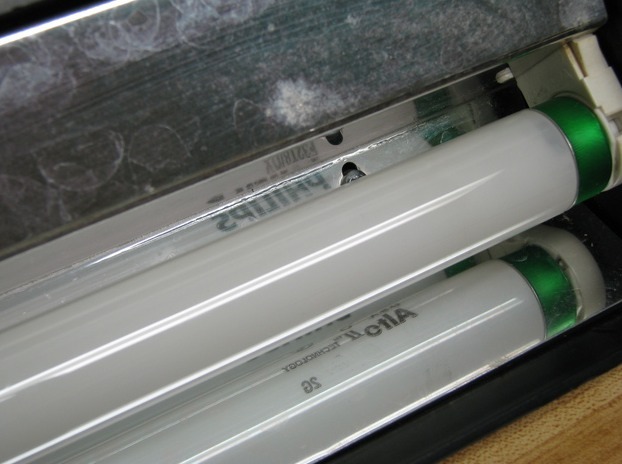 Fluorescent tube lights produce about the same light intensity for any length of tube, from about 24 inches to at least 60 inches. The longer bulbs are proportionally higher in wattage, so that the bulb wattage is mostly a measure of the bulb length, not the bulb brightness. 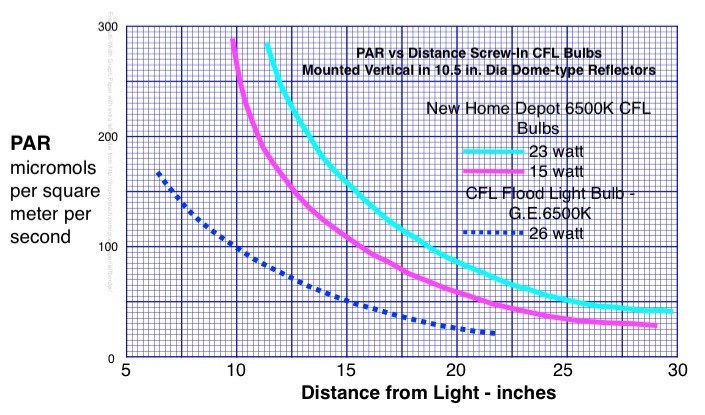 For bulbs shorter than 24 inches, this may not be true. 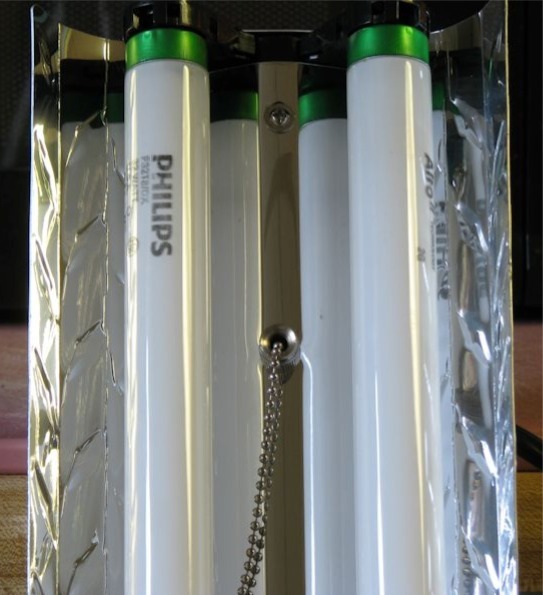 Home Depot 2 bulb Diamond Plate Shop Light – note the reflections of each bulb. 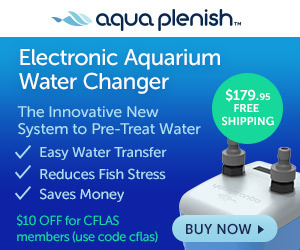 Give your bare-bottom tank a new look!